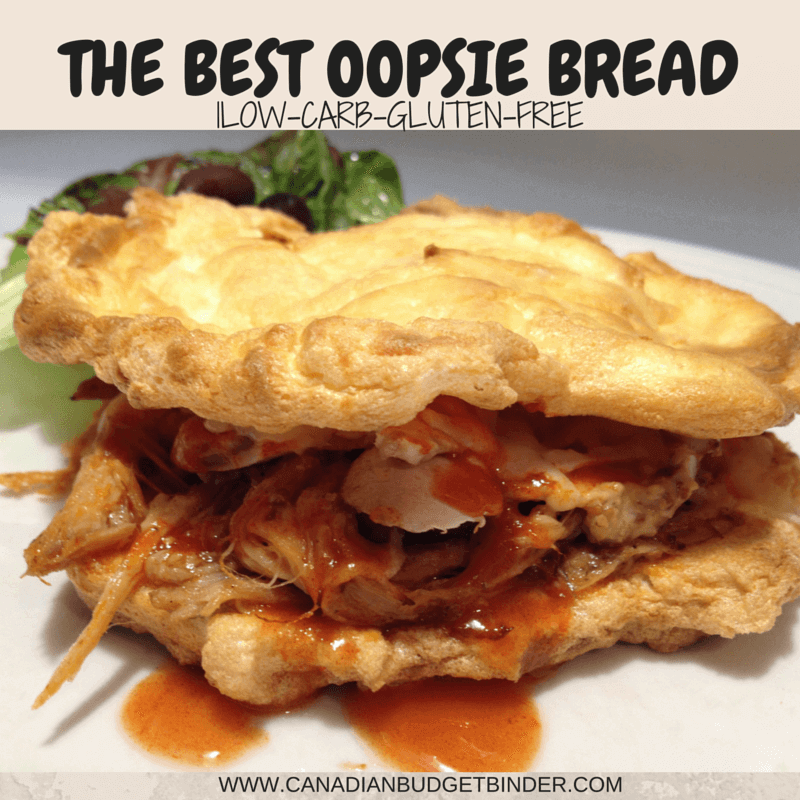 OOPSIE IS A LOW-CARB BREAD REPLACEMENT THAT IS TAKING THE WORLD BY STORM! If you haven’t eaten bread in months and you crave it THIS is the easiest and tastiest alternative in my opinion. I’m not a low-carb eater but my wife is and I’m the guinea pig who helps her create recipes and has to taste them first like this Oopsie Bread which I gave 5 stars. Don’t worry if you are thrown off by the captivating name of Oopsie bread because I was as well. My wife came to me one day and said the her friend who is also on a low-carb diet made this recipe for low-carb bread called, Oopsie bread. I said, Oopsie what? You probably did too BUT let me tell you even the skeptic in me was changed once I tucked into that delicious low-carb crock-pot pulled pork on 2 Oopsie bread rolls. Where does the Oopsie Bread name come from? I did a little research hoping to find out about Oopsie bread and just as the name suggests it was made as a mistake but a mistake that has made non-bread eaters rejoice. If it were me the recipe would be called something else a bit more colourful, lol since I don’t use the word Oopsie. Essentially it is a low-carb high fat (lchf) bread that will win you over if you’ve given up bread. I tried a few Oopsie recipes from online but I found that the Oopsie bread turned out too dry or I didn’t care for the ingredients.For the most part all the Oopsie recipes I found all have the same basic ingredients. It’s the technique to execute the recipe that makes or breaks it. I wanted to make a plain Oopsie bread that could be adapted for others who want to add flavours. I wanted to create Oopsie bread that my wife could easily make (so I don’t always have to) and that would withstand the weight of burgers, hot-dogs, sausages, pizza etc. Finally my wife’s friend passed along her recipe which I’ve altered slightly here to fluff the eggs and cream cheese a bit more. Big thanks to her too.. this is what my wife had to say about her first Oopsie bread experience on her lchf diet plan. If you are on a low-carb, gluten-free, keto or Paleo diet you’ll want to make these fresh if you can and store them up to 2 days maximum wrapped in tin-foil or Saran wrap. You can also store them in Tupperware on the counter which lasts about a day in our house. Even our son loves Oopsie bread with sugar-free jam on top after it comes out from the toaster. Yes, you can even turn Oopsie bread into toast or cake if you like. Since whipping cream is part of the low-carb lifestyle you can easily make some cinnamon flavoured Oopsie bread and then layer whipped cream on three stacked Oopsie bread rounds. If you want to flavour your whipped cream with sugar-free jello or erythritol (sugar substitute) you can do that as well or you can top it with sugar-free syrup for a lovely treat. You can also shape your Oopsie bread into whatever shape you like. If you know you are making hotdogs create oblong Oopsie bread as it is very pliable. You can make Oopsie bread grilled cheese, breakfast sandwich, Oopsie bread french toast and I’m betting a lovely Oopsie bread pudding is easy to make. The sky really is the limit with Oopsie bread as you can enjoy it plain, savoury or sweet. In one batch of our Oopsie bread we chopped a spring onion which gave the bread a savoury punch. 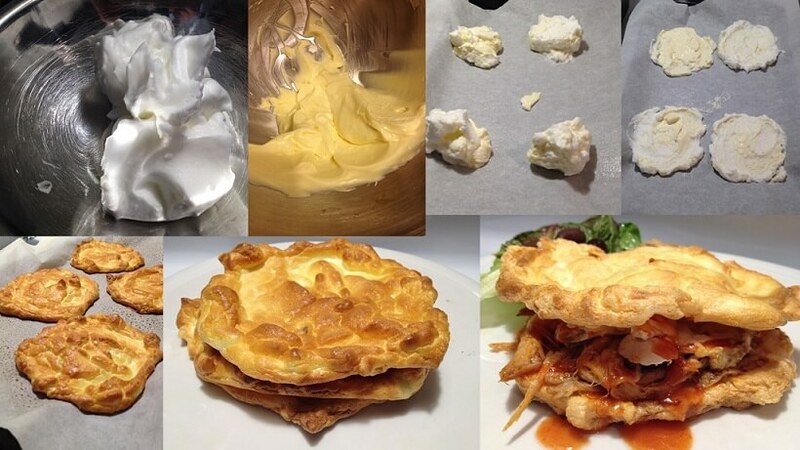 When you make Oopsie bread batter there are only 3 ingredients- Eggs, Cream of tartar and Cream cheese. I’m not a huge fan of adding salt but if you want to add a pinch you can to bring out the flavour in bread. After attempting many batches of the Oopsie bread I found that it’s very important to cream the eggs and cream cheese until it looks like a fluffy batter. I had the Kitchen-Aid stand mixer on high for about 2 minutes to get the consistency you see in the photos below. When you make the meringue it’s important to use the cream of tartar or some form of acid like lemon or white vinegar which I did not test with this recipe. I’d start with about half a teaspoon per egg-white as suggested by Deb Wise at Cooking Light blog. I think Deb Wise from Cooking Light explains what Cream of Tartar is beautifully in her post titled The Magic of Cream of Tartar and How to Substitute it. Most commonly, cream of tartar is used as a leavener, because when it’s combined with baking soda, together they produce carbon dioxide gas. That’s the same gas that’s produced by yeast in bread baking. When it’s added to egg whites, it boosts the strength of the individual air bubbles and slows down their natural tendency to deflate. For the low-carb pulled pork I simply added spices to the pork and put it into a crock-pot. I used salt, pepper, all-spice, cinnamon, paprika, chives and a pinch of cloves. I also chopped up 2 cloves of garlic before I put a half cup of water in the crock-pot. We cooked it on low for 10 hours over-night so my wife could sort it out the next day. She strained the juice so all the bits were removed and added it to a pot. She boiled the juice down with a teaspoon of xanthan-gum (thickener found at Bulk Barn or health food stores), 2 teaspoons of blueberries, 2 teaspoons of white vinegar and 2 tablespoons of Frank’s Red Hot Sauce. The end result was a tangy BBQ sauce but without all that sugar. She shred the pork into a baking dish and poured the hot low-carb BBQ sauce over to soak into the pulled pork. We took 2 slices of Oopsie Bread and one added a teaspoon of mayo, pulled pork, 1 teaspoon Franks Red Hot Sauce, 1 mushroom sliced and 2 tablespoons of shredded mozzarella/Soft Asiago mix cheese. We then put it back into a low-heated oven to melt, topped it with a second Oopsie bread and served with a side salad of greens. Delicious!! If you have a stand mixer or even a hand mixer this will make the recipe much easier. If you don’t have either you can make this recipe by hand but it will take some elbow grease. They do expand so make sure to keep some room beside them on the parchment paper which you must spray with a cooking spray. I baked them at 325 degrees for 15 minutes but watch your oven closely as they can burn quite easily and everyone’s ovens differ. Let them cool on the parchment paper once they come out from the oven and then you are good to start making anything your heart desires with Oopsie bread. Try switching up the flavours of Oopsie bread by adding cinnamon, parmigiano cheese, onions, chilies, taco seasoning etc. 507 total calories, 44.7 grams of fat, 6.6 grams of sugar, 6.6 carbs= 1.1 carb each and 7.45 grams of fat each 1 and just over 1 gram of sugar each. If you make them smaller obviously the totals will change. Low-carb eating is on the rise as is these amazing and easy to make Oopsie bread rolls. In a stand-mixer add your egg whites and beat them until they become frothy then add in your acid which would be the cream of tartar and continue to mix until soft peaks form. Bake for 15 minutes but watch them carefully as each oven differs and these can burn quite easily. Once golden brown remove from oven and let cool. If you’re looking for a low-carb bread alternative this is the quick recipe that will bring you much joy, I promise. There are also other low-carb breads called Soul Bread but they take a bit more work. I’ve made cinnamon swirl low-carb Soul Bread for the wife too and I’ll post the recipe soon. Enter your email address below to SUBSCRIBE to my blog. Once you subscribe you will be sent an email from me immediately which you need to open and approve the subscription in order to start receiving my daily blog post. Check your Junk Mail if you don’t see it or email me to check into your subscription status. Can the regular cream cheese be substituted with non dairy variation?